As we’ve been sharing here on the Disney Parks Blog, there are even more changes coming for Disney California Adventure park over the next year – especially toward the front of the park. Today guests can see the first bit of this exciting makeover as we’ve just unveiled the brand-new turnstiles that will welcome them each day. 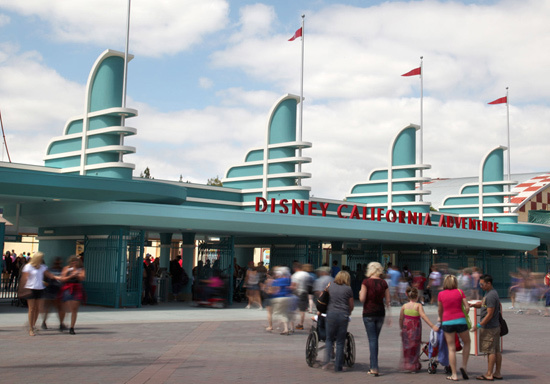 Inspired by the iconic Pan Pacific Auditorium, the turnstiles will set the stage for the new Disney California Adventure park entrance. Buena Vista Street will transport guests to Los Angeles as Walt Disney found it when he first arrived in California, with buildings inspired by structures that existed during the 1920s and ‘30s – including the Pan Pacific Auditorium. A landmark structure in the Fairfax District of Los Angeles, the auditorium was the premiere location for indoor public events until it closed after almost 40 years in 1972. Designed by the Los Angeles architectural firm Wurdeman and Becket, the auditorium itself was a modest wooden structure with seating for only 6,000 people; however, the building’s façade was hailed as one of the finest examples of Streamline Moderne architecture in the United States. The four stylized towers and flagpoles were meant to evoke upswept aircraft fins. One of the principal architects on the Pan Pacific Auditorium, Welton Becket, was a neighbor of Walt Disney’s and went on to become very influential in future Disney projects. It was Becket who suggested to Walt that he use his own artists – not an architectural firm – to design, plan and build Disneyland, and it was this advice that led to the creation of WED Enterprises (now Walt Disney Imagineering). 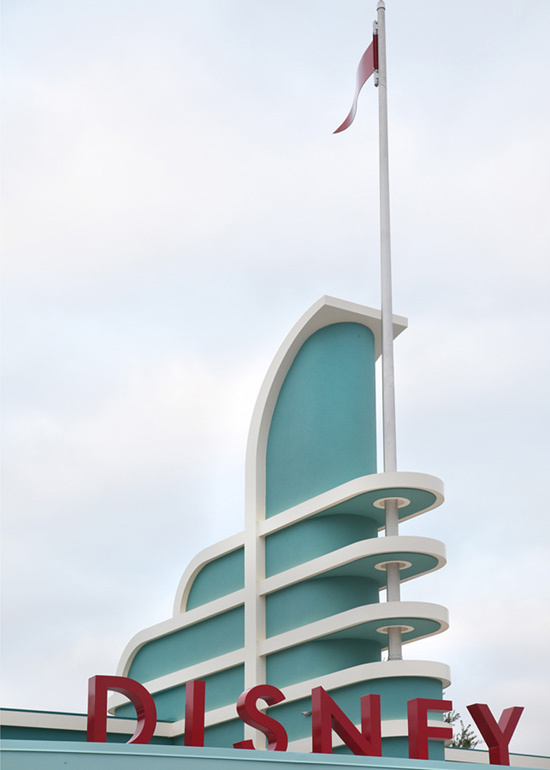 Later, Welton Becket Associates (formed in 1949 after Walter Wurdeman’s death) designed Disney’s Contemporary Hotel at the Walt Disney World Resort, though Becket himself did not live to see it completed. On May 1, 1989, a nearly full-size replica of the Pan Pacific Auditorium façade opened as the main entrance to Disney’s Hollywood Studios at the Walt Disney World Resort in Florida. Sadly, little more than three weeks later on May 24, the original building was destroyed in a fire.